As a homeschool evaluator in Virginia, I’ve worked with hundreds of kids in families who have used all kinds of weekly homeschool schedules. I’m also in my 19th year of homeschooling, and since we’ve moved around a lot, I’ve been in a ton of different homeschooling communities and groups with so many good homeschooling families. I’ve seen all kinds of weekly schedules work well for people, and creating a strong week of homeschooling can look different for each homeschooling family. Some families have weekly schedules that look like school schedules, but most homeschooling families use the flexibility of homeschooling to create a weekly schedule that is customized for them. Here are some of the homeschool schedules that I have seen work to create a strong homeschooling week. Yes, many homeschoolers follow the same schedule as schools, doing five or more academic subjects each day for all five week-days. This can feel familiar, and many curricula make the assumption that this is the schedule you’ll follow, so if you’re big into pre-planning and use a formal curriculum, the five-day school week may be the schedule for you. Some families do traditional academics Monday, Tuesday, Wednesday, and Thursday and leave the fifth day free. This often morphs into “Field Trip Fridays,” either as families or members of the same homeschool group or co-op plan field trips for the end of the week. Even though some families may not take a field trip every Friday, they leave that day open for errands, appointments, library day, and a head start on weekend trips. Some curricula offer both four- and five-day plans, built right into their materials. Other families divide their learning into traditional school subjects and address one subject each day. For example, they might do math on Mondays, English on Tuesdays, science on Wednesdays, social studies on Thursdays, and electives or “anything else” on Fridays (art, music, foreign language, etc.). The order might vary from family to family, but the idea is to focus on one subject more thoroughly and in-depth on each day. Is Homeschooling Right for You? What Is Deschooling and Why Is It Important? The parents and/or kids in these families like delving deeply into one subject per day, but they also want to do some of certain specific subjects every day. So the “plus” is commonly math practice, memory work practice, and/or language arts. So they’ll spend time every homeschooling day doing those added (“plus”) things, followed by one other subject. So, on Mondays they might do math and spelling, followed by science. On Tuesdays they might do math and grammar, followed by history. On Wednesdays they might do math and writing, followed by geography. And so on. For a younger child, the language arts portion might be a reading lesson or reading practice each day. For a child who wants to write or who needs practice, it might be writing each day. Memory work, which is an approach some families might take for learning facts like state names and locations, multiplication tables, geologic time periods, or U.S. presidents, is obviously something that works better when revisited frequently. In any case, homeschool parents using this kind of weekly schedule may have several things that are done daily because they are seen as the priority or because they are “practice-oriented,” while they designate other subjects for each day to give time for real exploration. If science can take up more time on Tuesday instead of switching from subject to subject every 45 minutes to an hour, then you have time to watch a documentary, read a passage, and do an experiment, all related to the same scientific concept. You will be building a lot of context for that science learning all within the same day, making it easier for a child to make connections rather than shifting gears constantly. Some families belong to academic co-ops that meet on a regular schedule, commonly once per week. While some co-ops are self-contained, with the kids doing enrichment learning at co-op with no expected follow-up, other co-ops have the core academic subjects. Students are expected to do assignments at home and study for tests given by co-op teachers. Parents will arrange their weekly schedules at home to help their children prepare for the coming classes at co-op. In my homeschooling life, I’ve been involved in Monday co-ops, Wednesday co-ops, and Thursday co-ops, some of which had homework expectations and some which did not, driven by the type of learning situation my kids wanted. If the co-op has the core academic classes a parent or child wants covered, then other academic interests that are independent of the co-op are also worked in around co-op homework, spread throughout the other days of the week. In some states, there are university-model homeschool co-ops where classes meet twice a week, using the same type of scheduling you’d commonly find on college campuses. A student might attend four classes on Tuesdays and Thursdays, and have Mondays, Wednesdays, and Fridays to complete homework at home. At other such co-ops, a child might attend class four days a week, with a Monday/Wednesday set of classes and a Tuesday/Thursday set of classes. Yes, this really does become somewhat more like a private school (and some private schools do operate this way), but in some cases, the kids really aren’t there more than several hours per day and don’t have access to the kind of comprehensive services that a school offers. Their education continues to be directed by their parents, and there is no official diploma awarded by the co-op. Obviously, this kind of co-op has a lot of the same kind of scheduling and homework challenges that attending school has. On the other hand, it may give students access to teachers who are more expert in their fields or to a more structured type of learning that they want or that the parent is seeking. These kinds of co-ops may sound like a dream come true for someone who has recently taken a child out of school in order to homeschool (“They cover all the subjects!”), but don’t be fooled; using a co-op as a replacement for school does not always work well, especially immediately following withdrawing from school. Instead, consider deschooling first. Some families have a parent who is working a more unusual shift or schedule, such as a hospital nurse or a firefighter who works three or four days on with three or four days off. Homeschooling can be coordinated to take place while the parent is working — if the other parent is an at-home parent doing the homeschooling. This way time off can be maximized with togetherness rather than worries about academics. Another approach may be scheduling the academics purposely during the off shift. This way, in a two-parent family, both parents can participate in the homeschooling, or in a single-parent family, the homeschooling can take place during time off with child care covering the work hours. In a large or busy family, extra curricular activities, sports, volunteering, and classes in the community go on the weekly schedule first. For example, the local science museum may be offering an eight-week class in archaeology on Tuesdays, and all three kids go for piano lessons on Thursdays, followed by library story hour. Fridays may be the day that your family volunteers at the animal shelter or at the food pantry. Families who make liberal use of these kinds of resources work other academics around these outside activities. I have known many families who have found that their kids took off with Scouts and 4-H projects to the extent that they actually became a large part of their academic learning, so prioritizing them made sense. Just as a matter of practicality, outside activities aren’t going to bend to your personal schedule unless you are the organizer, so putting outside events on the calendar is just a reality, especially as children get older. Families who use project-based homeschooling, interest-based homeschooling, unschooling, unit studies, and interdisciplinary homeschooling may not find school subjects or community activities to be the most compelling aspects of their weekly schedule. Instead, their homeschooling may revolve around where the project or interest or study leads. Their days of the week are organized around what they need and want to do to follow up on interests or projects. That might mean a day at home to research and plan and make lists. This might be followed by a day out to shop for supplies and materials. Then a day at home to build and create the project, along with more list-making and research for another round of resource-gathering. There might need to be a day to visit with a mentor or go to the library for books, or a day to wait for help from Dad or Aunt Janie. Homeschooling parents using one of these approaches may keep their weekly schedules fluid and ever-changing with each project, or they may have designated days that they know they will “stay home” or “be out,” and they tack on what is needed for the week’s learning to certain days. That way, material gathering will always be done on Tuesdays — a designated “out” day, while kids can look forward to help and undisturbed time for working on projects on Wednesday — a designated “home” day. In fact, many homeschooling families, especially those with young children, find that a mainstay of organizing their weeks is that alternating pattern of home- and out-days. A big day of errands, lessons, grocery shopping and volunteering needs to be followed by a slower paced home-based day to give everyone time to recover and have time for reading, playing, exploring, and helping with home maintenance. This may especially be true for people living where there are a lot of activities available to homeschoolers, so they have to be careful not to over-schedule. However, it can also be a wise rhythm for families who live in rural areas who have to drive long distances to activities: scheduling firm home days can be a relief from being in the car too much and valuing outside activities over home-based ones. The home/out alternating schedule also provides relief for both your extroverted children and introverted children — who can look forward to having time to recharge with the level of interaction that helps them function best. 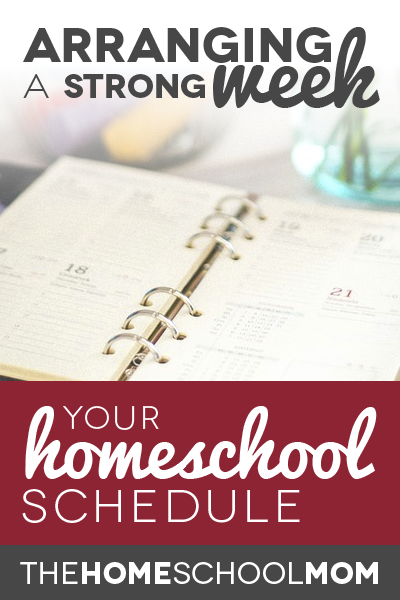 The truth is, most homeschooling parents have to consider many of these things in creating a strong homeschool schedule for their week. They may participate in a co-op, have regularly scheduled outside activities, do shift work, and use a curriculum alongside interest-based learning and projects. Or, they may be unschoolers whose kids nonetheless participate in a co-op and a lot of community activities, service work, and time with mentors. Everyone also has to figure in time for grocery shopping, meal preparation, laundry, home maintenance, and appointments, and many have to include part-time or full-time work. A strong weekly plan takes these things into consideration, along with time for the homeschooling parent to take a break and pursue her own interests. You might find some kind of weekly planner to be a useful tool in working out your strong homeschooling weeks, and as something you can post on the fridge to keep your whole family aware of the regularly occurring weekly events (TheHomeSchoolMom has a free homeschool planner here). In any case, thinking not only about your homeschool year but also your homeschool week can be valuable in preparing for your upcoming season of homeschooling. Rest assured that not everyone follows a school pattern for their weekly schedule, and you can flex your week to meet your family’s needs — and your own. Ask Jeanne: What Curriculum for Homeschooling Active & Outdoorsy Boys? A popular speaker at homeschooling conferences, business groups, and parents’ groups, Jeanne Potts Faulconer homeschooled her three sons in North Carolina, Mississippi, and Virginia for twenty years. Jeanne is director of Brave Writer's Homeschool Alliance, which provides homeschool coaching, community, and "grad school for homeschool" for parents. She is the contributing editor for TheHomeSchoolMom newsletter and writes the popular Ask Jeanne column, addressing homeschool parents' questions here at TheHomeSchoolMom. She is a former college faculty member, former editor and book reviewer for Home Education Magazine, a long-time editor for VaHomeschoolers Voice, and a news correspondent for WCVE, an NPR-member station. Holding her Master of Arts degree in Communication, Jeanne has conducted portfolio evaluations for Virginia homeschoolers for evidence of progress for many years. I’m wondering how single/divorced parents work out a homeschool schedule. My children are old enough to be home alone while I work but aren’t keeping up with the schedule I planned. The goal was that they’d work independently while I’m at work and I could pick up on more difficult lessons when I get home but that’s more of a dream than reality. I don’t have any family or friends who could “oversee” them and am having difficulty finding a sitter or tutor who would work 3-4 hrs a day to keep them on task. I’m not sure I can keep up with spending all my time after work and on weekends homeschooling without burning out pretty quickly. Any advice? I would say, maybe try giving them incentives to finish their work. Give them a schedule to follow, and as soon as they finish their core subjects, they can have a hour or two of free time (a movie/documentary, video games, or hobbies) and a snack. As soon as they are done they can check in with you (call or text) and you can give the okay for their free time. You can help them with whatever they had issues with when you get home. If they don’t fulfill their responsibilities they lose privileges. If they do, then they maintain or gain privileges. If there is anyone who would be willing to give them a call or stop by to check on them, this can be helpful too, to hold them accountable. Maybe the other parent if he or she is still involved. I’m going to say a prayer for you right now. I’m sorry you are going through this difficult situation. I was a single mother of 4 once, so I understand. I pray that you will have a blessed homeschool journey and that you will find the resources and people who will support you along the way. Sounds like your kids are old enough to be home alone, but not ready to be home alone and responsible for school work of the type you are expecting. I hear that your goal of them working at home and then you helping with difficult things at night is not working out. It’s pretty common for homeschooling not to work out the way people hope. Many people find they have to change their homeschooling approach and their expectations or do things a different way. You don’t say what type of homeschooling they are expected to do while you’re gone, but it’s really not unusual for kids not to be able to work independently, especially if a program is not engaging them. My suggestions are to try something that is more engaging for them, that they want to work on while you are out. 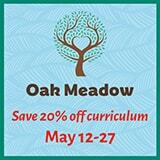 This could be a different approach to homeschooling altogether or a different curriculum. 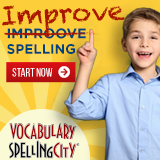 You might also try flipping the timing – with them doing homeschool work in the evenings when you are home. They may gradually become more independent, partly in an effort to get their evenings more free – or they may really need the assistance to stay on task, which would not be unusual. Many people who work do indeed homeschool at night and on weekends to make things work. You might also try finding another homeschooling parent who needs to earn extra money, who might be interested in having your kids several days a week and helping them with what they’re learning. A university student might also be a good option, if you have a university near you. We have an article called Can Somebody Homeschool My Kids that explains some of the possibilities. I would also suggest that you find and network with other employed parents who are homeschooling, so you get support and ideas about how they are working things out. While many employed parents do make homeschooling work well, there are a lot of variables that can make it easier or harder in some families. Some kids are just compliant about doing expected work, or they so strongly desire to learn at home that they are willing to do it while a parent is away. However, many of us don’t have those kids, and we have to find other ways to help them learn – a different schedule, a different program, a different setting, etc. Some people find they are able to take kids with them to the office or work part-time from home to make it work. Some check in using Facetime or Skype to help kids keep things on track. When something isn’t working, homeschoolers tweak and change to try out new ideas. Good luck in finding something that will work for your family! Jen, the “one-subject-per-day-PLUS” is a really workable solution. Many people find they are “almost” doing it, but their brain hasn’t quite freed up that idea that they could have Science Mondays, History Tuesdays, Art Wednesdays and so on – but do their math and language arts every day. I love how this option allows for deep dives. And enjoy those Field Trip Fridays! Well done! I have only been home schooling my kids for 5 years, but find this info to be on point with what I have observed. We do the 4 day method and reserve the 5th day for a co-op that does the fun, elective type stuff like art and gym. Next fall we are also looking at adding homeschool partnership classes…drums, piano, and swimming lessons. I get overwhelmed wondering how I will pack it all in, but every year can look different…so I know I can change it up if it gets go be too much. Anyway, thanks for the great article! I enjoyed reading it. Glad you found the info to be on point. You are right that homeschooling changes from year-to-year. That’s one reason why we want parents to be aware of the many ways they can schedule their weeks. There are lots of great options for scheduling, and homeschoolers’ schedules don’t have to look like school schedules. Good luck adding in the new activities. You’ll find your rhythm! I really love this article. You explain the different schedules so well. Thank you!